One of our favorite pastimes here at Cream City Cuisine is sitting down and watching shows on the Food Network while we enjoy the results of our latest foray into culinary experimentation. One of our favorite shows is Chopped, which showcases four chefs fighting in a reputation death match over a three course elimination. It was during the dessert round of a Chopped episode that we came up with the following recipe. In true Cream City Cuisine fashion, we threw a bunch of stuff together in a bowl – a pinch here, a dollop there – and viola! The Happy Hour Mocha Cake was born. We hope you enjoy this one as it features one of our favorite local beer makers: Lakefront Brewery. Please beware that this recipe, more so than others, is a result of estimated measurements. 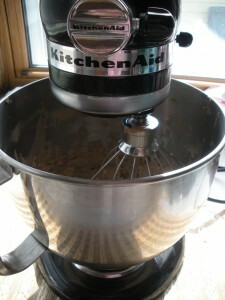 Prepare brownie mix as directed, but substitute a 9×13 pan for the 9×9 that the recipe calls for. This will ensure a thinner brownie and save you some prep time later. Reduce baking time to 25-30 minutes. Remove brownies from oven and set aside to cool. Meanwhile, in KitchenAid mixer use wire whip attachment to beat together mascarpone cheese, powdered sugar, and cocoa powder until blended. 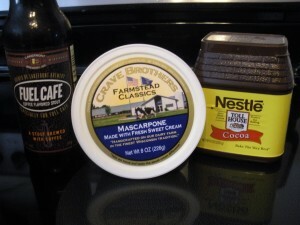 Add Lakefront Brewery’s Fuel Cafe 1 tbsp at a time (1/4 cup = 4 tbsp), mixing well after each addition. Refrigerate 30 minutes. 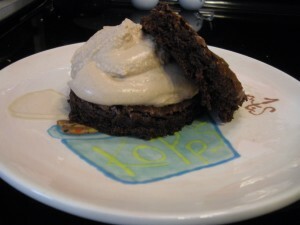 Serve with generous portion of filling between two slices of brownie. If plating for a party, cut brownies into triangles and serve on a platter with cheese paired as a dip. NOTE: Filling begins to thin if left out at room temperature for more than 30 minutes. If serving at a party or buffet, be sure to change out cheese mixture often.